No matter what you do for work, there’s a good chance you have to communicate with people… at some point, or another. How well you do that determines not only your success at what you do, but also the quality of your relationships and connections outside of your workplace. Having a framework for how you can improve the way you communicate with people might be the game changer that you need to make substantial improvements in your life. 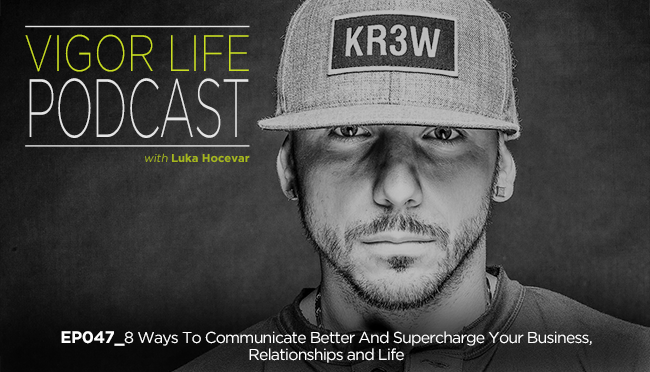 In this episode, I give you that blueprint, and discuss seven rules that will help you improve your conversation and listening skills. I think you will be surprised by amazing conversation can be when you have these skills. Why conversations are not a promotional opportunity! This entry was posted in Podcasts and tagged Business, Entrepreneurship, Fitness Business, Goals, Life, Mindset, Motivation, Podcast, Self Development, Self Help, Success, VigorLife. Bookmark the permalink.